Argentina lost to Japan for the first time in their history on Friday, thanks to an 18th-minute goal from Shinji Okazaki. 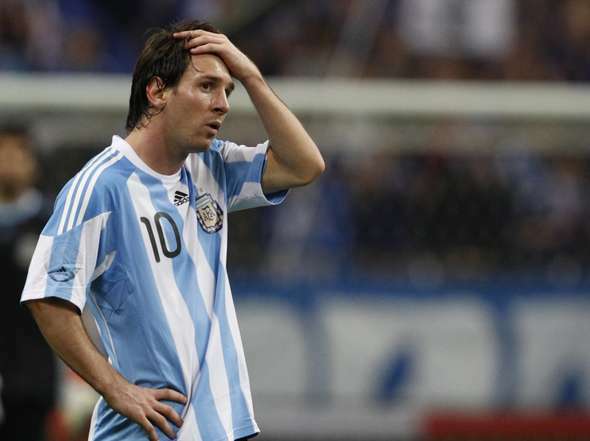 Only Lionel Messi and Javier Mascherano really did themselves any sort of credit, and a side clearly as worn out by the long voyage from Europe as were Spain when they travelled to Buenos Aires last month left the pitch deflated. Diego Milito, Esteban Cambiasso and Mario Bolatti were all injured. Seba over at Mundo has some thoughts on what this means for Sergio Batista as manager, and here are the match highlights for your viewing pleasure (if you’re Japanese, or Diego Maradona, that is). The travel excuse is hard to swallow in this match when around 8 of Japan’s starters flew from Europe as well. Argentina is a team in flux. It is no surprise that they are not world beaters every time out. It is going to take some time for Batista(or Sabella ?) to determine how he wants to organize, and then fine tune the attack. To his credit, he has ditched honorable, but internationally over the hill Veron, and is giving time to Pastore and D’Alessandro. For my money, it is only a matter of time before Pastore is the cream that rises to the top. No more Veron, and no more Riquelme. With a young able enganche, coupled with Argentina’s glut of attacking talent, it seems that with an adequate coach Argentina should eventually become a squad that is going to score goals regularly. Holding midfielders should be set with Mascherano, Banega and Cambiasso. The defense, on the other hand, is flat out poor. Mixing and matching mediocre centerbacks across the backline is not going to get it done. Arguably, Walter Samuel, Gabriel Milito, and an ageing Javier Zanetti are the only reasonably talented players for international play Argentina possesses at fullback and centerback. There needs to be a monumental talent search, followed by trials by fire, for the applicants to fill in the swiss cheese gaps on defense. Romero has to do better with the goal. I agree. It seems everytime a new keeper comes along that appears to have some potential, he is immediately thought of as a saviour. Romero seems to be a fairly decent keeper, but nothing more than that. I hear Andujar has been looking good lately. I hope Batista starts looking at giving others a chance. Tough for Batista to make wholesale changes at the moment though. He wants to WIN and cement his position.